What Do NCLEX-RN Sample Questions And Nursery Rhymes Have In Common? Comprehension Booster Tip #1: Set the Scene. Create a mental image of the scenario in your NCLEX sample question. Be literal and be vivid! Pick up your mental paintbrush and decorate your mind’s eye canvas. For example, if the sample question is about the treatment of a patient who has a cast on his or her leg, visualize that cast. Zero in on which leg is in the cast and any other important details. Comprehension Booster Tip #2: Decode your picture message. It’s not enough to see it; you must also explain/confirm to yourself what is happening in the scene. Because you will be using this technique on NCLEX exam day, you will be writing down this explanation rather than speaking it out loud. Comprehension Booster Tip #3: Connect the Pieces. Examine the text structure of the specific sample question. What are the individual pieces telling you? Much like a puzzle, you will need to connect the pieces in order to decode the message. Understanding the elements of a question will help you analyze and think critically about its meaning. Comprehension Booster Tip #4: Apply Existing Knowledge. 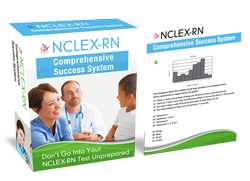 Tackle each NCLEX sample question with confidence and authority! Apply what you already know about a given treatment or medical procedure. Maybe you’ve studied for months, or you might already have practical knowledge from working years in the medical field. In either case, you have a wealth of knowledge waiting to be unleashed.You will start to see the sample questions and answer rationale more clearly: Patient is in cast + complaining about calf pain + experience tells me + question to answer lies in the action I must take Using the “NCLEX Sample Questions Comprehension Booster” technique will help you develop the habit of actively thinking about test questions you read. That’s right: No more reading yourself into a mind-numbing frenzy! Practice the above steps right now with any mock question. Connect the pieces; examine how each variable affects another and see the comprehension booster equation start to take shape. What are the pieces telling you? Be confident as you apply existing knowledge to determine the best answer. Repeating these steps will lead to greater retention and understanding. With practice, you will find that your mind no longer goes blank and that you can quickly and easily answer NCLEX exam sample questions. Now, take what you’ve learned in this module and practice boosting your reading comprehension every time you read a practice or actual NCLEX RN question. The “mental imaging” techniques you’ve learned by using the NCLEX Sample Questions Comprehension Booster will help you be successful on exam day. Below are some NCLEX-RN practice questions you can use to get familiar with the test content, format and structure of exam questions. 1.) A patient diagnosed with cirrhosis and ascites should have: A. A low sodium diet B. A clear liquid diet C.	Six small meals a day D.	An NPO sign on their door 2.) An elderly patient needs a surgical procedure. When explaining the procedure and consent forms to the patient, the nurse should: A. Have the family present so that one of them can sign the forms if the patient doesn’t understand. B. Ask the patient to read the forms to her C.	Speak slowly and clearly, frequently asking the patient to voice understanding D.	Just ask the patient to sign the forms, as they are necessary for upcoming procedures. 3.) The first sign of hypoxia is: A. Blue lips B.	Irritability C.	Disorientation D.	Discolored nail beds 4.) The nurse checks on her patient and finds that his respirations are nine per minute. He is receiving oxygen at 8 liters per minute. What should the nurse do? A. Turn off the oxygen B. Nothing – the patient is fine C.	Increase the oxygen D.	Call for a crash cart 5.) Which food, when eaten by the patient, increases the serum level of cyclosporine? A. Chocolate B. Milk C.	Grapefruit D.	Asparagus 6.) The nurse is preparing to administer a newly prescribed medication to the patient. During conversation with the patient, the nurse finds that the patient is allergic to medications that are Escherichia coli products. The new medication is Neupogen (Filgrastim). The nurse should: A. Call the physician before administering the medication to report the allergy B. Give as directed – the allergy to E. coli products has no bearing on this medication C.	Reduce the first dose, then observe and document any ill effects D.	Administer into the TPN port that is already in place 7.) When collecting lab samples all of the following apply except: A. The specimen is labeled with the patient name, date, time, and contents B.	Specimen jars or other containers must be tightly sealed C.	Specimens should never be refrigerated D.	Always use gloves and sterile equipment when collecting specimens or lab samples. 8.) Your patient is receiving Coumadin therapy. What should the PT lab value be if the Coumadin level is therapeutic? A. 2 – 5 seconds B. 9.5 – 12 seconds C.	18 – 20 seconds D.	7 – 9 seconds Answers and Rationales: 1.) Correct answer: A Sodium can increase acuities (fluid trapped in the abdominal cavity) B – A clear liquid diet is not indicated for this condition, and increased fluids can be detrimental. C – Only a low sodium diet is required, meals are served normally. D – There is no indication that this patient should have nothing by mouth. 2.) Correct answer: C Speak clearly, so that your patient can understand you, and give you feedback that lets you know he does understand. Patients who seem disoriented or confused should not sign legal documents. A – Family members cannot sign for the patient unless they have made prior legal arrangements and have proof of the right to make medical decisions for the patient. B – Elderly persons may not have good eyesight, or may not understand the document even if they can read it. D – Having your patient sign forms without being sure they understand the content is illegal and constitutes medical abuse. 3.) Correct answer: B Lowered oxygen content to the brain causes irritability first. A patient that suddenly angry or snaps at workers should have an O2 sat monitor on hand. A – C – D are all signs of decreased oxygen saturation, but they are later signs. 4.) Correct answer: A The amount of oxygen taken in tells the brain how many breaths are needed. Too little oxygen causes an increased respiratory rate, too much, and the respiratory rate decreases. A prolonged period of too much oxygen can cause death, just as too little can. B – A respiratory rate should not be less than 16. C – Increasing the oxygen will further compromise the patient’s respiration and oxygenation. D – The crash cart is not necessary at this time. 5.) Correct answer: C Grapefruit should not be eaten when taking this drug. No other food has this effect with Cyclosporine, so A – B – and D are wrong answers. 6.) Correct answer: A Neupogen is an E. coli product, so the physician must be notified and the drug withheld. B – This answer is a false statement. C – The nurse cannot make this determination and it oversteps the bounds of RN autonomy. D – This answer is wrong for two reasons. The medication cannot be administered, and nothing is given through a TPN line except the nutrition, and insulin in some circumstances. 7.) Correct answer: C Some specimens must be refrigerated while waiting to be processed so that bacteria growth or heat does not give false readings. A – B – and D are all true statements regarding specimen care. 8.) Correct answer: B 9.5 – 12 seconds is the normal PT (Prothrombin Time) A – This time is too short and will cause early and dangerous clotting C – This time is too long and will allow abnormal bleeding D – This time is not within the normal lab value limits See this free: More NCLEX Practice and RN Review Tips now.